Used in professional and smoke free studio (we have 2 for sale, this listing is for 1 unit only). The MP-500NV is a single channel mic preamp that is designed to take the classic sound of the all-time studio-standard 1073 preamp and bring it to a new level of modern sonic fidelity while fitting neatly into a 500 series rack. Does MP-500NV meet its design goals? Absolutely, with accuracy, transparency and vintage "tunable" sound! The circuitry allows for brilliant transformer saturation or the soft distortions of a single-ended amplifier. The sound of electric guitars, sound modules, and drums to add vitality, presence, and real punch benefit from extreme pushing of the MP-500NV. Great River MP-500NV at a Glance. Great with all mic types. The MP-500NV is a professional quality microphone preamplifier designed to re-create the vintage sound characteristics of the early 1970s large consoles. Modern components give the MP-500NV more clarity, punch and performance under normal use. 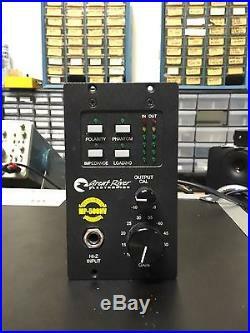 In addition, features like metering before and after the major gain stages let the user drive it hard to greatly expand the range of sonic options. All microphones will benefit from the power of the MP-500NV preamplifier, including dynamic, condenser and especially ribbon types. 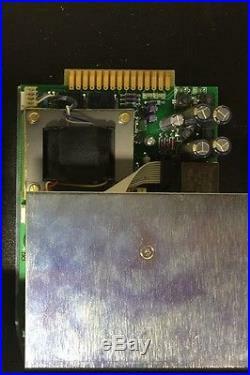 The MP-500NV uses the same audio and metering circuit board found in the NV series preamplifiers. This unit is designed to fit into a 500 series rack using 2 available slots. It receives its power supply from the host rack. The unit is equipped with a HI-Z instrument jack that has its own input amplifier and was designed for DI applications. The Great River MP-500NV features iron in the signal path for that big vintage sound. Its no-latency output monitoring provides a buffered sound feed to your DAW workstation. The MP-500NV's hi-Z input is ideal to shape the sound for bass, electric guitar, and sound modules. Dual metering provides visual monitoring of gain staging. The ultra-quiet noise floor delivers "stealth" performance for rich, textured vocal sounds. The Great River MP-500NV also has a full +70dB of input gain so you can take that prized ribbon mic out of the cabinet for a rich, creamy sound with all the detail and no muddiness. XLR balanced in and out connections. Hi-Z input on front panel. Output gain from -25 to +10db; maximum overall gain 70db. Frequency response: 20Hz to 75kHz. 2 or 3 stages of single ended solid state amplifier gain blocks. Front panel polarity, phantom power, input impedance, and output loading switches. High quality, custom wound Sowter transformers. Output transistor and transformer with heavy 70ma Class A bias. Local regulating of each channel. Iron in the signal path for that'Big Vintage Sound. Ultra quiet noise floor with'stealth' performance for rich, textured vocal sounds. Our feedback approval is 100%. All items are from a smoke free professional recording studio. BEST OFFERS - Please submit offers directly using the "make an offer" button. We will then either accept, decline, or counter accordingly. 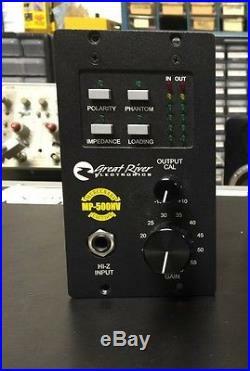 The item "Great River MP-500NV Microphone Preamp Module for API 500 series Chassis" is in sale since Monday, August 01, 2016. This item is in the category "Musical Instruments & Gear\Pro Audio Equipment\Preamps & Channel Strips". The seller is "privaterecordingstudio" and is located in Las Vegas, Nevada.